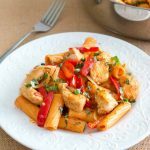 This spicy chicken riggies (rigatoni) is a true comfort food – warm, hearty and brings the whole family around the dinner table. Quick & easy too! 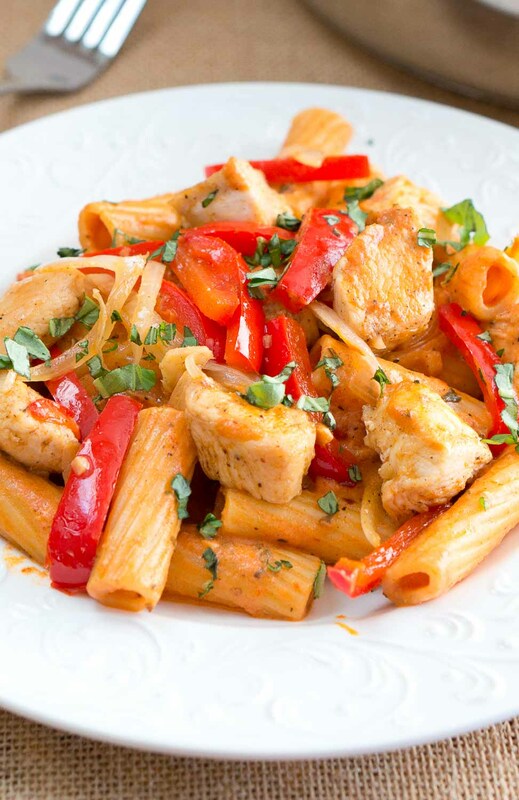 Spicy Chicken Riggies or Spicy chicken rigatoni is a hearty pasta dish made with sauteed chicken, peppers, and rigatoni pasta, all tossed in a delicious creamy ragu sauce. It’s an Italian – American dish that is very popular in the state of New York. This dish reminds me of my childhood – the flavors and the smell of the pasta sauce cooking on the stove bring memories of my childhood. Home cooked meals are so special and I hope to be able to continue and pass on the tradition of making delicious meals at home for my family. 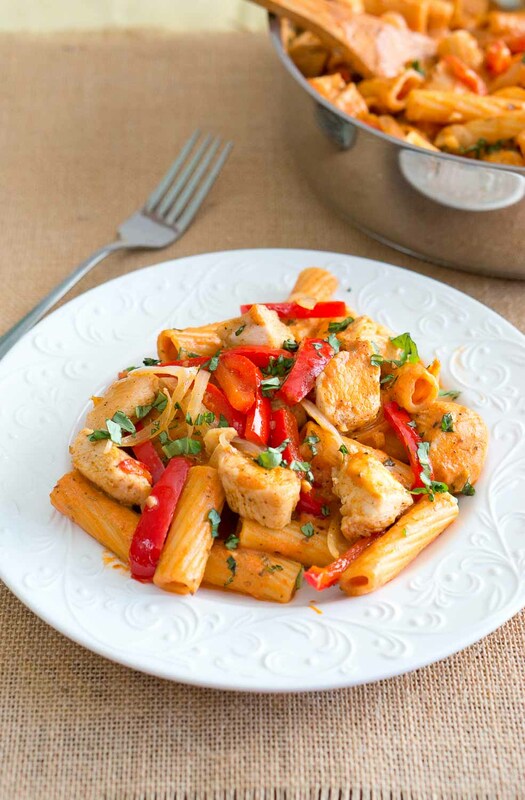 These spicy chicken riggies (chicken rigatoni) are not only easy but also fairly quick to make. It only takes about 25 minutes to make this dish from start to finish. While the pasta is boiling, you can cook the chicken, and then mix the pasta, veggies, chicken & sauce. 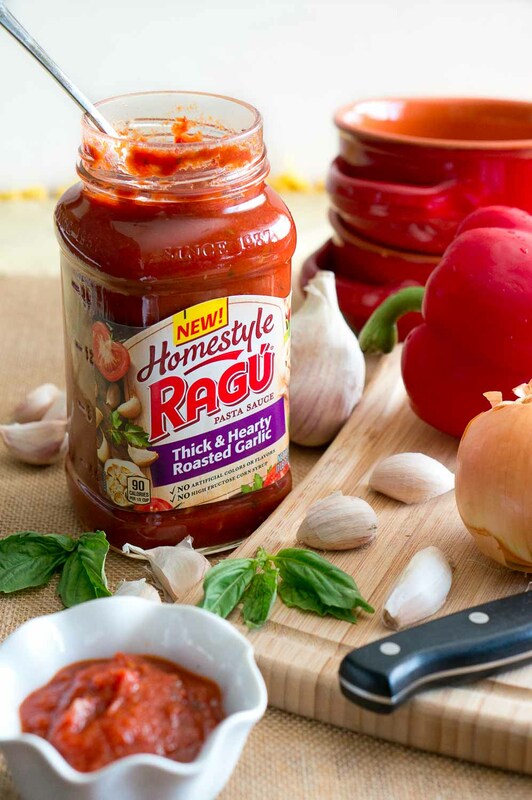 The sauce for the chicken riggies is made with a whole jar of Ragu Homestyle Thick and Hearty Roasted Garlic Sauce with a bit of cream. Love it when dinner can be served on the table within 30 minutes. Can’t beat that! And leftovers make an easy lunch for next day. Win, win! You can also easily double the recipe to serve a crowd. These sauces are amazing, friends! They taste homemade, have a fantastic flavor and are made with real ingredients. The sauce tastes homemade because it’s slow simmered to perfection, with vine-ripened tomatoes, and a special blend of herbs and spices. I also love that the pasta sauces are free of artificial flavors, colors and high corn fructose corn syrup. Ragu Homestyle Sauces come in 5 different flavors. I have made several gluten free pasta dishes with the new Ragu sauces, and my favorite is probably the Roasted Garlic flavor. It is perfectly seasoned, and you don’t need to add anything else. You have to try it and see for yourself, you won’t be disappointed. What is your go-to weeknight dinner the whole family enjoys? Check out Ragu’s website for more pasta inspiration. Boil rigatoni pasta according to package instructions. Season chicken with salt, black pepper, garlic, and paprika. Heat 1 Tbsp olive oil in a large skillet over medium-high heat, and cook chicken until cooked through, about 6-7 minutes. Transfer chicken to a plate. Heat remaining 1 Tbsp olive in the same skillet, and add sliced bell peppers, cherry peppers, onion, and garlic. Season with salt and freshly ground black pepper. Cook for 4-5 minutes until vegetables have softened. Add cooked chicken, cooked pasta, pasta sauce, heavy whipping cream to the skillet and toss to combine. Add some red pepper flakes if you want to make it more spicy. Serve topped with chopped fresh basil and parmesan cheese. Enjoy! 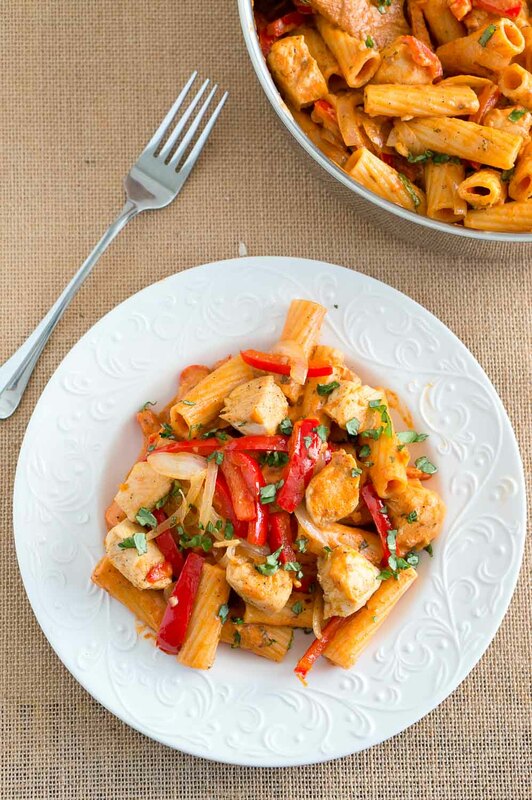 This spicy chicken riggies (rigatoni) is a true comfort food – warm, hearty and brings the whole family to the dinner table. Quick & easy too! Add cooked chicken, cooked pasta, pasta sauce, heavy whipping cream to the skillet and toss to combine. Add some red pepper flakes if you want to make it <g class="gr_ gr_6933 gr-alert gr_gramm gr_run_anim Grammar multiReplace" id="6933" data-gr-id="6933">more spicy</g>. Well this looks like a glorious bowl of comfort food if ever i’ve seen one! So delish!!! This looks so hearty and tasty! Thanks for sharing! 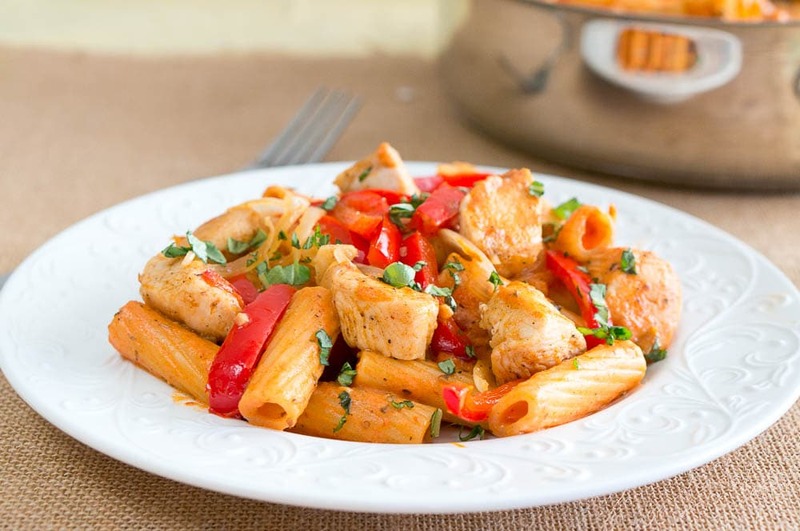 I love anything spicy, so this pasta is a must try for me! Yum! This chicken dish is delicious. love the flavors! Oh yum, yum, yum! This recipe is right up my alley! I love spicy food and this is a great weeknight dinner option that my family will love! We love spicy meals, so this is a great dish for dinner. Thanks for sharing! This is the perfect easy weeknight meal! I love simple pasta recipe and this one sounds like a winner. I used to use Ragu sauces a lot before. They are definitely yummy. My family loved this meal! They ask for it almost every week! Yay! Awesome! SO glad they loved it! We are so busy with shopping, wrapping and baking right now that I hardly have time to even think about dinner. This is perfect for those hectic times — looks delish too! Wow, a plate of colorful, flavorful and delicious dinner! I love a spicy red sauce on my pasta and this looks like the perfect recipe. I’ll be adding this to our monthly rotation of recipes! That looks like the perfect comfort food for this cold weather! I love a little kick in my pasta dishes! Thanks for sharing! Love how easy this pasta is to put together! That ragu sounds so good. This is s meal that my family requests again and again! We love it! love a good pasta meal here! hadn’t heard the term “riggies” for rigatoni before.